Then of course, there’s the point that even the past can change, and — who knows what the current divergence will look like with five years of hindsight and post hoc corrections? Remember how the 1970s kept warming for three decades afterwards? I think they’ve added an “adjustment to the adjustments” to include the mythical ocean warming … either that … if a lot of countries understand that if their temperature measurements show warming they stand to gain an awful lot of money – there’s a massive incentive to “help” the figures show warming. You have nailed it, sir. As with everything involving money, greed shows up quickly. Other countries want money and particularly, they want the money of successful countries. Global warming is just the latest rubric that allows them to do this. In the pursuit of money, no truth matters, no honesty matters, no recorded data matters – all of them can be twisted, falsified, or ignored, and all of them will be, if the payoff is big enough. Examining the satellite records against tropospheric radiosondes (see RATPAC for the latter), indicates that both UAH and RSS trends start diverging from the radiosondes perhaps ten years ago – while remaining wholly consistent on a monthly and even yearly basis. Possible reasons include satellite constellation changes, differences between MSU/AMSU instruments, further uncorrected diurnal drift (unlikely, those issues have been under scrutiny for some time), or perhaps upper atmosphere changes that are not accounted for in the satellite radiative models. I expect that there will be more to come on this issue. Having said that, I wonder if it really matters any more, anyway. And didn’t they prove it? As is said, once burnt is twice shy. The UN employed ‘global warming’ as the Trojan Horse but learned quickly by 2000 when it ceased to oblige, that climate change was a preferable and unfalsifiable vernacular. The UN definition of ‘climate change’ clearly obviates any need for any further pretense of science. The precautionary principle remains the sole requirement. So now we’re presently seguing into ‘sustainability’, which conveniently means just about all things to all people. Civil Society is another one of the favourites, designed of course to be heard as ‘civilised society’, which of course it is not. Feral cunning about sums this up. RATPAC also shows at least 1/2, and possible more of the temperature increase is natural. Possible reasons [for the trend divergence between satellites and radiosondes starting "perhaps ten years ago"] include satellite constellation changes, differences between MSU/AMSU instruments, further uncorrected diurnal drift (unlikely, those issues have been under scrutiny for some time), or perhaps upper atmosphere changes that are not accounted for in the satellite radiative models. Notice how he takes for granted the fault lies with the satellite datasets, not at all with the radiosonde datasets. Actually, I consider the surface records to be the most reliable. And while the relationship between the long term radiosonde record and surface temps has remained relatively stable, the satellite data has begun to diverge, as discussed in the opening post. Or did you miss that part? This must be the reason Mann et al are in such a hurry to discredit satellite data. While UAN/RSS was within the error bars of Gistemp, the disconnect could be ignored. With the pause-busting GISS201506, there is now to much difference. Both can’t be right even if they are not measuring the same exact things. I see no reason, as a scientist, to believe any of it any more. The greenhouse theory is false. The radiative transfer theory as applied in climate science is false. The temperature records are totally immersed in a fog of adjustments and re-adjustments, which have been shown to be systematic and [snip] biased to give the appearance of global warming. And it is all boxed in layers of propaganda by radical ideologues and amoral politicians, all of whom are incompetent to judge the failed science for what it really is. Science is literally being thrown away by this generation, to serve a false spirit of political revenge, a “transformation” of the political order that is no longer based on anything [snip]. The surface record has a lot more years for which they have to do their adjusting. If (IF) the keepers were still completely honest, I think it would be fascinating to know what their adjustments produced if they only used the fraction of the raw data that started in 1978, the same year as the satellite data started. Being a rather isolated island and therefore unaffected by any other close by land masses the Iceland Met Office has a very carefully constructed set of long term temperature data along with modest adjustments to account for local conditions going back to 1931. No further adjustments to the data unlike GISS and the NCDC and HadCru who automatically adjust temperatures daily, which with using break point adjustments leads, unbelievably, to constant changes in the daily temperatures recorded prior to WW2. The Break Point adjustments [ Changing the Past ] almost invariably lead to a cooling of past recorded temperatures and so create an almost totally spurious long term warming trend in the last half this past century and into the present century. The Icelandic Met Office has made no further adjustments to its older data since 2000. Again from Not a lot of people know that site and also from a number of other skeptic sites we see this which pi**ed off the Icelandic Met Office no end when they were told about it by a skeptic blogger. What you see here is the standard modus operandi temperature adjustment system of Tom Karl’s NOAA based GHCN and NASA’s Hansens / Schmidt’s GISS and to a lesser extent UK’s HadCRU all seemingly designed to increase apparent global warming temperature trends as a global warming / climate change propaganda ploy. Iceland Met has noted that 2015 was the coldest year this century in Iceland. The AMO has gone over its natural peak and is starting to head downwards. The REAL temperatures in the Arctic will now start to drop. This belies the folly of claiming to measure the “global” temperature to an accuracy of tenths of a degree with a smattering of land-based thermometers. And then averaging the figures to an “accuracy” of a hundredth of a degree. Surely, to average ten readings to one tenth of a degree when the readings are to the nearest whole number is proper. Don’t throw the baby out with the bathwater, even if the water is dirty. Alarmist keep saying we shouldn’t throw the baby out with the bathwater but, no one has actually seen the baby hiding in the bath tub. They continue to tell us how they checked under the bed, in the closet and out behind the shed and they know the baby must be there somewhere so now they know she’s just keeping warm in the depths of that tub of dirty water. The null hypothesis says that there never was a baby in that tub of dirty bathwater. The baby is not hiding. She’s outside playing like all good little kids do. Depending on the dataset used, it is actually about 1500 data locations with 730 measurements each, or over a million data points. These million plus measurements are taken at a consistent time each day to make them as consistent as possible. Unlike the satellite measurements that are taken at different times and locations each day. Hardly a ‘smattering’ and certainly sufficient to give us an accurate measurement to within a couple of hundredths of a degree. Doubling or trebling the number of data points does not provide a worthwhile increase in accuracy. It doesn’t matter which data set above you choose they all show at least 0.14 degC of warning a decade provided you don’t cherry pick a scientifically unacceptable short time period. … it is actually about 1500 data locations with 730 measurements each, or over a million data points. 1500 x 730 = x is not a valid computation. 1500 is a discrete count of stations (over a very small portion of the earth’s surface – see comment 10.1 on this thread), and the other is a function of time. Just because you happen to have two numbers, doesn’t mean that it is meaningful to apply an arithmetic formula to them. I saw eight sheep today, and ate two donuts for breakfast. Therefore today was worth 16 donut-sheep, or each sheep was worth four donuts. You choose – both statements are equally meaningless.
. . . or each sheep was worth four donuts. Wrong. Five of those sheep were three years old and the other three were only one year old. So each donut was worth 9 years. Please check your math before posting. I am obviously not as inter-mate with sheep, as you seem to be. Look at all that grey. and those squares that they do have are something like 250km by 250km, and may have one highly affected urban or airport station.. and they don’t even know what quality data they are getting. Even in America, the clowns had no idea of the crap quality of their sites until someone else (Anthony Watts) did the work for them. Result, 80%+ were did not pass their own quality test. Even now, some 40% of all USA data is marked with and “E” for estimate, yes, seriously. On top of that, add the massive fabrication and adjustment of that scrappy, inconsistent, sparse, low-quality data, with a very obvious political agenda, by a group of rabid AGW supporters. The fox is in charge of the henhouse.! The whole surface station data set is a monumental scientific JOKE. A white elephant that should be have assigned to the dustbin long ago. ALL measurement involves some kind of transducer. A transducer is a device that transforms the measured parameter into a signal parameter. The presumption is that there is a transfer function that establishes the relationship between the measured and signal parameter. This transfer function is usually based upon a non-linear function determined by the physical properties of the transducer. The resulting value is exactly correct except for one important thing: the units, the degree of non linearity, the systematic error, the dynamic noise, and the detailed shape of the response curve are not well resolved by using physical relationships only. Since a transducer is manufactured, it can never match it’s intended physical model exactly. Hence ALL transducers must be calibrated using primary standards and the resulting transfer function is computed by the relationship between the standard and the corresponding signal delivered by the transducer. In is important to understand that the calibration process is not the same as “adjusting/correcting/selecting/manipulating” the data even though it kind-of looks like it. It is simply a process by which one establishes the units of measure of the final signal. The accuracy of which depends upon the care with which the transducer was built, maintained, and calibration. The result thereby earns the title of “Data”. ANY further adjustments, corrections, and the like are derived values and lose the right to be understood as “Data”. They are at best derived values that might or might not be appropriate to use for a given purpose. The validity of which depends upon the nature and validity of the manipulation and the proposed use of the manipulated results. As soon as the purpose of the manipulation is to achieve a preconceived result, ALL validity is lost. The reason we measure things is to discover what reality is and not to force it to conform to what we want it to be. If we manipulate/correct/adjust the measurement to be consistent with a predetermined goal, it is nothing but an attempt to fake reality. Eventually all such attempts fail. Agreed. Unfortunately, “eventually” takes a long time to arrive. In the meanwhile, there’s plenty of opportunity to scam nations and individuals out of their money and to obtain a cushy job in Fearmongering, Inc. It is curious to note that fearmongering is supposedly bad in politics, but if you can claim “Science!” then it’s all well and good. Likely the remote sensor folk have many many pages of notes calling out what may be wrong with their own numbers. This is like when real folk took measurements using the best instrumentation at the time, also had margins on both sides of the double spaced table for notes concerning best guess for why the numbers are so weird. This is where the actual ‘data’ is, and notes are first to be suppressed for ‘agenda’. I agree the measurement and comments are the best you will ever get of “whatever, at that precise whenever”! May anyone that attempts to modify any measurement quickly die in a horrible manner! I wonder:How is it even made possible to change established data-?? That is because all the temperature data is deemed to be owned by the establishment, and can therefore be changed to fit the current establishment policy directives. Didn’t you get the memorandum? Tsk, tsk Rereke, so young and yet so cynical. Being conned and having your pocket picked by your own government has a way of bringing out the cynic for those of us who pay attention to what is going on. It looks from mid 2013 to 2016 the GISS-HadCRUT4 are reaching for the 1998 El Nino peak, considering the timing of COP21 this all appears perfectly plausible and predictable. Might be instructive to look at when Gavin Schmidt took over from Hansen. Hansen maybe had just one honest bone in his body.., Gavin, not so many. Good point.Gavin controlling the levers and tweaking the knobs.Mathusian/Marxist machinations and bugger the reputation of science. Can some remind me, exactly how many surface thermometers are there outside of Europe and the USA? For instance how many are there on the continent of Africa? Also can surface thermometers close to large bodies of water truly give an accurate temperature indication of a surrounding area of land? Is the surface thermometer stations’ coverage truly enough to give an accurate indication of the global thermal dynamics, given that 2/3 of the earth’s surface is water? Not only are surface thermometers very sparse in many areas of the world, but they have NO IDEA of the quality of the stations they are using. Many are in urban areas or near runways with almost certainly very large UHI effects. Then they use to UHI affected and airport temps to adjust the tiny amount of unaffected rural sites still remaining, and smear the result over the areas they don’t have data for. On top of that they add the Karlised, imaginary sea temps. …and the sooner the surface data is tossed in the bin for calculating anything to do with “global” values of anything, the better ! Thanks AndyG55, that’s the info that all TV, radio, and news paper articles should include with their dumb (alarmist) reports. Comparing satellite data to surface thermometers temperature data is just as crazy as comparing a good resolution video to a cave painting for scenic accuracy. I’m not saying surface thermometers are not useful — they are for indicating local changes and for regional daily weather information — they are just rubbish a giving an accurate idea of global warming. Andy and Tom. Wrong. The surface data is where we started and where we will finish. What it needs is improving, and the hardware for doing this is becoming ever more available. Your opinion is not one I share. Satellites do a much better job that is truly global. Maintaining enough accurate ground stations with good reliability is just too expensive. Ground stations are good for keeping local temperature records but only if the raw unadjusted data is maintained and made publicly available. Yes, but. We live on the surface. That we can agree on… finish the white elephant, for good. There is already a very good satellite system, and it would be an absolute WASTE of money, let alone almost impossible, to put in a reasonably dense, evenly spaced, unaffected network throughout the world. The African continent’s temperature recording stations are thin on the ground with my count of 22 stations [ per Peterson et al ] across the whole of the whole of the African continent that recorded the mean and maximum temperatures in 2009. The African continent is just over 30 million square kilometres in area. The USA is 9.857 million square kilometres in area. I knew I had seen it before but then lost track of it when my older PC died. It’s no mystery, it’s fe**ing [snip]. The fact is that IPCC cannot account for the lack of warming! Have you ever wondered how much warming is missing? Nope. No mention of oceans/El Niño there. And there are no oceans in a greenhouse. For the oceans from 0 – 2000 m for the period from 2005 – 2015. Perhaps one should not be looking too closely at the actual values, and the supposed accuracy of the instruments, but to verify any “drift” in the instruments – i.e. how the accuracy compares at the end of the series with the beginning. If there is little difference, then the dataset could be confirmed as indicating a trend. Unfortunately, it seems that the surface records have been mauled rather too much for that to hold, there; there has also been a drastic reduction in recording stations, with many in higher latitudes and altitudes, as well as general rural sites being withdrawn, leaving the amalgamation of the data suspect. Also, surface stations only monitor an isolated area, randomly and often sparsely distributed over the land surface, and even more sparsely over the oceans. However, the satellites have the benefit of uniformly monitoring the entire globe, and the resultant data has not been adjusted too much. So, what is the trend they show since their instigation? There was a big gap in 2007 which resolved in two years. This gap is longer, but may resolve soon too. 2007 > 2016 = 11 years = One solar cycle’s length ? The run down towards the Solar minimum. The fall off in the Solar magnetic fields and consequently a reduction in the solar magnetic fields effects on the Earth’s upper atmosphere ? Doubtful, but we still only know a tiny smidgin of what there is to still learn about how the Solar system and the Sun and its planetary bodies and Space itself all interact. Just ran my eye over the long period graph, 1965 to 2015 Oulu Neutron Monitor, the ground level measurements of incoming Cosmic rays. Eyeballing seems to show there may be a tenuous link or a coincidence of data at times between the Oulu Neutron Count aka; incoming Cosmic ray levels and a number of upswings and down swings in satellite derived temperature measurements as per Jo’s and David’s graph above. I doubt that a statistician would class this as a serious link but considering the lack of genuine knowledge , not counting “invented knowledge” which is merely putting lip stick onto a fat pig and claiming it a beauty contest winner, in so much of climatology, any such possible link should be considered. And it could be something as mundane as the cosmic ray impacts on the satellites and its sensors slightly affecting the calibration of the sensors for a short period. Probably already accounted for but still !! ? According to the satellites, most of the warming in the last 30 years occurred in the northern hemisphere. Since there is no way to measure the lack of warming in the oceanic southern hemisphere it is hardly surprising there is a bias. Then there is UHI effects and adjustments of course…..
GISSTEMP and HadCRUT4 records are continually adjusted to reflect the rise in temperature which, is sought by the IPCC and is known by the IPCC to be caused directly by manmade CO2. The RSS and UAH are adjusted to ensure an accurate and scientific result. The result, naturally, is a divergence. Correct. What now needs to happen is to educate the public about this deceit. The majority of folk don’t like being conned especially when they find out their hip pocket is being impacted. GISSTEMP and HadCRUT4 records are, in all probability, continually adjusted to track CO2 figures from Mauna Loa Observatory, Hawaii. That way the spurious idea that temperature tracks CO2 is inferred by the fudged temperature records. The satellites appear to respond more to both El Nino and La Nina events – they are more influenced by ENSO than the surface records. You’re right, of course. There’s always been a gap between the land-ocean temperature data sets and the satellite data sets. As I pointed out to DavidR in the Climate Change Is Toxic thread, they measure different things. By piling the data sets one on top of the other, the differences between them are obscured. Here’s the data without offsets from woodfortrees. The reason the gap looks more pronounced now is because, as far as the satellites are concerned, the warming has stopped. I’ve added trend lines to the data sets starting from 1999 to avoid the claims that skeptics like to start their graphs in 1998 because of the strong 1998 El Nino. Clearly the cooling trend is under way, even without taking into account the ’98 El Nino. I used 5.5 year means rather than 6 month means. I’ll explain why if anyone’s interested, but in any case it makes the graphs smoother and the gap easier to see. What, five and a half hours and no red thumbs? Let’s see if I can remedy that toot suite. The reason the gap is more pronounced now is because the warming has stopped, as shown by the satellite data. The only reason the land-ocean data sets don’t show the same cooling is explained in Jo’s article back in June, 2015: Exotic adventures in global data to unfind “the Pause”, by Karl in 2015. The two graphs towards the end of that article show the massive adjustments made to both the land records and the sea records. The past is adjusted to show cooler temperatures and the present is adjusted to show more warming. All in the name of science, of course. That should wake up those red thumbers! So its ok for people to be deliberately deceptive but not to point out that they are being deliberately or incompetently deceptive. YAWN. And a “statement” of fact can be credible but false. It can be honest but also wrong. The “credibility of statements” is not the same as their accuracy, nor of the validity of arguments, nor the fact of measurements and observations. Argument by authority or ignorance, and ad hominems (reasoning by analysing the man) can be right by accident but are never ever in a million years Scientific. They are not observations of the climate even if they are accurate observations of some human socioeconomic or psychological phenomenon. .
Here’s a really useful site that has real working scientists assessing the claims of various journalists about climate change that I discovered today. All it does is have science assess the claims made in the article. It should help you in avoiding unbeleivable sources. This reference discusses similar arguments to the ones you made in your argument that it wasn’t the hottest year on record. Translation: Here’s a site with Certified Government Paid “Scientists” who don’t know the scientific method, but can tell you a scientificy sounding answer. It works because when the thermometer doesn’t give the right answer, the scientist can delete it or fix it. Yes, your link is to one site that shouldmost certainly be avioded if seeking the truth or reality. A couple of years ago a roll was taken of REAL Scientists and Engineers that frequent this blog. I guess that DavidR must have seen that list. And as he says, everyone should avoid using unreliable propaganda sources like SkS and CF. Not imaginary scientists, folks, but real ones; and not broken scientists either, but ones that actually work once you have wound them up. I’ve been amusing myself with scenarios in the agencies, if there’s a new Repub POTUS in the fall, and he tasks them with backing out all their deliberate errors. Dr Roy Spencer gives his opinion of the Watts et al study that shows that US surface stations have a UHIE increase in temp of about 50%. Dr Spencer carried out his own US study that also found about 0.5 C of extra UHI warming. He states that this effect would be found all around the globe and he also states that better temp stations have been adjusted to match the doubtful contaminated stations. The new clean USCRN data-set also shows no warming for the last 10 years. The divergence between the satellite data and the surface based datasets of the NOAA/GISS will become topical. Joanne Nova and others are looking at this phenomena closely, even scientists at the GISS have commented on the discrepancy in light of the El-Nino. If the RSS TLT data does not spike above the surface of the GISS/NOAA during this El-Nino (as it would normally be expected to) it raises the question as why is this El-Nino different. The reality is that this El-Nino’s expected spike in TLT data above the land based indexes has now become an impossibility with the El-Nino in rapid decline. The only reason so far put forward for the breakdown this well understood and historically observed behaviour is the GISS/NOAA inflating temperatures in an attempt at removing a vary embarrassing hiatus. The truth is this El-Nino will severely damage the reputation of both the GISS/NOAA and the UK Met. It seems that NOAA’s own satellite data actually verifies RSS and UAH. The rapid rise in the satellite estimates in 1998 occurred AFTER the El Nino went into decline. It is more correct to refer to the 1997/1998 El Nino and the 2015/2016 El Nino so you are aware of the comparative years. Temperatures in 2016 are expected to increase by a further 0.1 degrees C and the satellite records will also rocket. The linked graph shows how much the satellite records climbed after the end of 1997 compared to the GISS surface temperature record. We can expect the same this year. Jo, the peaks in 2016 have not occurred yet; so I don’t see how you can assess them, all the data we have is from 2015. In 1998 the satellite record peaks, as shown in the graph I posted, jumped about 0.5 degC. At the same time the surface temperature peaks only jumped about 0.2 degC. The satellite peaks appear to stay higher for longer. If the same increases occur this year the satellite peaks will again be above the surface peaks. Look at the two year run up to the peak in 1998. Not the same. You are all conjecture. Nil fact. The satellite records started about 0.1 – 0.15 degC further below GISS in 2014 than in 1996 but the rates of increase over the two year period since then are pretty similar. And the fact remains that you can’t assess the 2016 peaks against the 1998 peaks until they happen. It’s a simple point I know but worth repeating don’t you think. No, it’s not worth repeating. Despite your time-wasting waffle there is a divergence and you (or rather, none of the people you copy your thoughts from) can explain it. As I said, maybe it will resolve… exactly as I have written in the post. To recap this discussion and show just how many attempts have been made to divert the discussion rather than address my factually supported points. Darcy said: The reality is that this El-Nino’s expected spike in TLT data above the land based indexes has now become an impossibility with the El-Nino in rapid decline. Jo said: And in the graph above, the peaks that were close enough to look concurrent in 1998 do not look concurrent in the same scale and with the same equipment in 2016. I replied: Jo, the peaks in 2016 have not occurred yet; A fact strongly supported by the current date. Jo claimed” Look at the two year run up to the peak in 1998. Not the same. I replied with graphs highlighting the two years prior to 1998 from exactly the same source as Jo: No significant difference if you ask me, Jo. 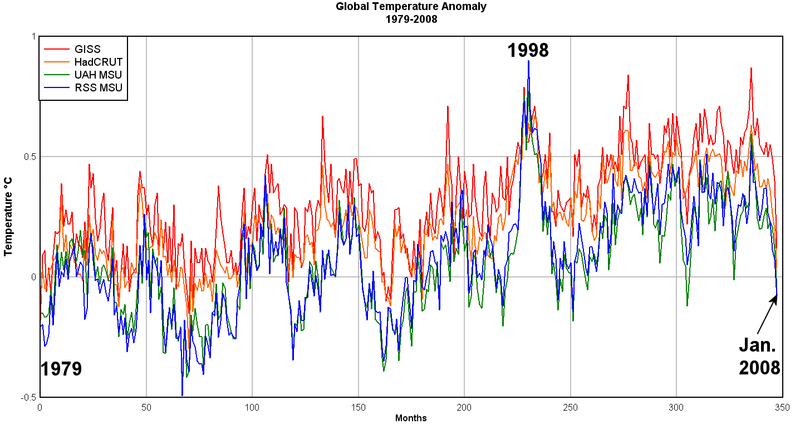 AndyG then chirped in with “In the first graph, no warming at all, you mean“. presumably referring to the entire 4 years of the graph rather than the two years being discussed. In every single response an attempt has be made to switch the conversation away from the factually correct statement I made without even providing supporting evidence. And as you’re obviously losing the discussion chuck in an unrelated issue and an ‘ad hom’ attack “you (or rather, none of the people you copy your thoughts from} to round of the discussion. DavidR – no, instead you have made dozens of points, all of which we’ve knocked over, and you silently dropped all your lost ones down the memory hole. Timewaster. You said satellites were not measuring the surface, but you use the satellite trends to “prove” the surface ones are OK. Hypocrite. Your pattern of commenting is persistently untruthful or careless and grossly time-wasting. I am “this close” to putting your comments in the spam bin for good. You waste too much of my time, and teach me almost nothing new. In the first graph, no warming at all, you mean. We have already established that fact, thank you. Thanks for even further ammunition showing the blatant manipulation of data since Gavin took over. You are helping immensely, DR. Here you use different graphs with different offsets to dismiss the point made in an obvious simple graph in the post which you can’t explain. Of course a divergence will “disappear” if you regraph the lines without sticking to the original start point. The divergence is a divergence, it is still there — I have not claimed it means a lot nor claimed that I knew what caused it. The divergence is caused by the fact that the UAH data set shows about 0.07 degC less warming that the surface temperature records and RSS shows about 0.15 degC less since 1979. As you have started all your graphs with the same starting point in 1979 a divergence is to be expected by 1998 and we would expect it to double by 2015. Its very obvious if you check the trend lines. Why the data sets show different rates of warming is still open for discussion, but the variation doesn’t mean a lot. Congratulations, after dozens of comments and nearly 5 days you have almost understood the post. exactly. Please don’t waste any more of my time or you’ll lose the right to comment here. You need to self-snip your logical errors. All of them show warming since 1979. Coincidence? Given that most show warming I guess that one person, Phil, is OK. Or does he only cherry pick one dataset and start date using the 1998 El Nino event, then pretend everything else is a conspiracy? duuuuuurrr, John, you don’t even know who Dr Phil or the CRU are, do you. !! Seems poor little johnny failed climate propaganda 101. I’m having a bit of trouble understanding why anybody would post here with that level of ignorance and do so without apparently doing a minimum of easy research so that they at least didn’t make total a fool of themselves in front of a bunch of Skeptics. I don’t think he realises how ignorant he really is. !! Type “climategate” into google and read what you find. You’ll have one hell of an education. Oh, and don’t bother with Wikipedia. They’re liars. Only the very deluded prattle on about conspiracy — their very real conspiracy delusion appears when they imagine others have notions of conspiracy. Thats the line that really gets me. Thats the line that proves these people are not just hubristic and deluded, they are mad and dangerous. I would say the fact that both the satellite data and the surface temperature data show significant and similar upward trends,is proof positive that all the conspiracy theories about data manipulation are just that “conspiracy theories”. With all the satellite and surface temperature data showing real increases one can only assume that most of the comments here are just wishful thinking. That’s right folks, remember our climate may be affected by magnetic fields, solar particles, solar spectral changes, cosmic rays, solar cycles, aerosols released by phytoplankton which change cloud formation, ozone levels… etc, none of which are included in climate models. But bow before DavidR, because he *knows* that if it warmed from 1980 – 2003 it was “CO2″. We are lucky to have a god in our midst. It is odd though, for such a brilliant man that he is incapable of a simple conversation about the validity of adjustments to surface thermometer measurements, or of confirmation bias, systematic influences on peer review, university appointments or government funding. The satellite data DOES NOT show an upward trend. It shows two basically flat trends separated by the 1998-2001 El Nino step. That event was the ONLY significant warming in the whole of the satellite data. Bit like a staircase isn’t it AndyG55, If I only step on the flat bits and ignore the rises I’m not really going up. What the RSS data shows us is a 0.1 dC rise from 1979 – 1997, then a 0.2, dC rise through 1997-1998 then a 0.1 degree rise since then, and now with the current El Nino another big jump. No one ever suggested that the rise would be a steady climb just that it would be continuous over a scientifically relevant time frame. The slight warming from 1979 -1997 has been all but cancelled by the slight cooling since 2001. I’m sorry if you have a monkey’s understanding, from your AGW brain-washing, but please don’t keep trying to push your ignorance onto others. The 1998-2001 El Nino was NOT a CO2 forced event, but a solar forced one, and only a [Snip] propagandist would consider otherwise. And because that was the ONLY warming in the whole satellite record, that means that there is absolutely NO CO2 warming signature in the whole 37 years of the satellite record. Yes.. we all know that you HAVE to use the 1998-2001 El Nino to create any trend what-so-ever. The ONLY warming in the last 37 years. And please don’t pretend that humans or CO2 had anything to do with it. You would look like even more of a fool. “Coincidence?” No they do not coincide. The surface data sets is diverging because of data manipulation and the abysmal quality and sparseness of the surface data stations. And yes we expect some warming from the Grand Solar Maximum during the latter part of last century. And none of the data sets, (no matter how much Gavin, Phil and Tom try), show anywhere near as much warming as predicted by the climate-game models. And that El Nino was nothing to do with CO2. Tell me, how will your brain-washing be affected when temperatures start to drop once the current El Nino subsides? Time to think about your options… Run and hide, I suspect. Without a doubt its a travesty and a crime against humanity, NASA should concentrate their efforts on Martian weather. I believe they have been tasked with a Muslim outreach program instead. Screen captures of your censorship of the truth will make interesting reading on a few hundred climate blogs and social media threads. You will be ignored there, too. That’s what you think – I know how many visit my blog, view my video, open my websites (now over 115,000 in total) and yet cannot prove me wrong. Nor can you. Doug, The auto censor does some funny things. Just because you get an “in moderation” notice, means nothing. Doug Cotton, you do waste rather a lot of electrons around the blogsphere trying to convince some very smart people that you are even smarter than they are. If ROM you have some physics that’s relevant which you wish to discuss, I’m happy to help your understanding of entropy and thermodynamics, in which I have done the equivalent of any PhD in Physics. I have been first in the world to explain the relevant thermodynamics which explains all planetary heat transfers correctly, and which is supported empirically, but whether or not you choose to learn from what I have explained is of course your prerogative – and no concern of mine. Well you will have to get a move on to convince a far more important set of people than just bu**erising around and spouting off ad nauseam in the blogs about your personal mental block if you want to win that Nobel Prize you have set your heart on. The Nobel committee doesn’t award any prizes to deceased persons. I thought they did once or twice? So where is your Nobel prize? In which journal was this published? it would only be the equivalent of a PHD in physics if you had it assessed by the top experts in your field and it produced numerous peer reviewed publications. Hot air is not the same thing. How’s your steak cooking in front of those four radiators in this experiment. How’s your egg cooking in a fry pan under the sun in Lightning Ridge? Probably quite well with about 800W/m^2 to 900W/m^2 of solar radiation (five times the average) out there. So what? You keep saying that solar radiation has nothing to do with warming…..
115,000 doesn’t seem that many, when compared to the number of English speaking peoples in the world. I wonder how many of those 115,000 were unique visitors, and how many were people revisiting? Was it 115,000 unique visitors who never came back? Or was it Doug’s significant other, visiting 115,000 times, in order to make Doug feel more loved? As a web statistic, the number of visits doesn’t really count for much at all. What is more interesting, is the number of conversations, and interactions, between visitors to the site, that do not involve the host (or hostess) at all. And regarding the number of people who cannot prove you wrong, how do you account for apathy, and the “what a load of rubbish”, response. Sorry Doug, but that is the nature of the web. Not entirely true. He did get one reply. And he posted as “Atmospheric Physicist”! Those with a genuine interest in knowing what happens in regard to climate in accord with the laws of physics may wish to read a copy of my comment that was censored here but now appears on WUWT here. In continuing with the incorrect assumption that back radiation (such as from carbon dioxide) causes the surface temperature to rise, David Evans (in his series of articles) only serves to reinforce the false IPCC physics pertaining to radiative forcing. He could learn a lot from what I have explained, but deigns not to do so. Carbon dioxide has no warming effect what-so-ever, and we now know this from valid physics …. The Stefan-Boltzmann law tells us that, for a perfect blackbody which has been receiving a steady uniform flux of radiation for a very long time the temperature achieved by that flux is proportional to the fourth root of the flux. But if the flux is variable (as with night and day for planets like Earth and Venus) we can show mathematically that the mean temperature achieved is always less than the temperature that would have been achieved by a steady flux having the same mean value as the variable flux. Hence the mean temperature of the whole Earth-plus-atmosphere system is not 255K but a lower temperature perhaps more like 240K. Likewise, even if there were a mean flux of 390W/m^2 reaching Earth’s surface, because it is variable, it would not achieve a mean temperature of 288K (15°C) but rather a mean temperature close to freezing point. However, even the net 390W/m^2 shown in those energy budget diagrams is not what can be used in Stefan-Boltzmann calculations: the solar radiation is only 168W/m^2 for which the blackbody temperature is 233K (-40°C) and we cannot combine that with back radiation (as they do in the energy diagrams) to “explain” a higher temperature close to freezing point. So it’s all wrong, and we need to go back to Square One. Once you understand that the temperature gradient is the state of maximum entropy (which in physics is called “thermodynamic equilibrium”) then it follows that new thermal energy absorbed in the atmosphere each morning will spread out in all directions, just like new rain water falling only in the middle of a lake. Some of this new thermal energy actually moves up the temperature plot, meaning downwards towards the surface or core of a planet. The process involved is called natural (not forced) convective heat transfer and, in physics, this includes thermal diffusion. In solid regions it is called conduction and, in all cases, it involves the transfer of kinetic energy between molecules as they collide. The process continues even in the crust, mantle and core, and all temperatures above and below any solid surface in a planet are anchored by radiating layers in the stratosphere and upper troposphere where radiative balance is maintained with the insolation. And that is how and why a planet’s surface is hotter than the radiating temperature of the planet, and the necessary heat transfers are not by back radiation at all, but by this process that is entirely non-radiative. Jo – It is a sad reflection on any blog when censorship of comments is allowed in order to promote the blog owner’s views and quash opposing views. The plain fact is Jo, that Loschmidt was right and the consequences regarding climate are huge. Back radiation is not needed to raise the surface temperature, as it is already warmer than back radiation and solar radiation could make it. Anyone who continues to be gullible enough to believe that back radiation helps the Sun to raise the surface temperature above the -40°C mean temperature that 168W/m^2 of solar radiation could achieve at most in a perfect black body (which is not what the surface is anyway) and then also promulgates their false belief, needs to pause and ask himself what it is that he hopes to achieve. It’s all wrong, and it is dishonest to promote it, especially when you don’t understand the physics involved, and thus perhaps don’t understand why it’s wrong, and is indeed in an altogether irrelevant paradigm pertaining to radiation rather than non-radiative processes. Place a small electric bar radiator at a distance where you just start to feel it warming your skin. Let’s say it makes an object (like a piece of steak with a steak thermometer) 40°C. Now place another three identical radiators surrounding your steak each at the same distance, thus delivering four times the flux. Stefan Boltzmann calculations used (incorrectly) as the IPCC do by adding flux then say the temperature of your steak should rise to 170°C. Try it! Does it? If not you have successfully refuted the whole greenhouse garbage science. This farce by NASA sort of reminds me of another myth spread by lots of clueless armchair physicists; reverse causality in the delayed choice quantum eraser experiments. First come up with a theory then twist the explanation of the observed data to fit that theory even if the consequence is something that’s absolutely impossible become possible. Leonardo DiCaprio has just told the World Economic Forum in Davos in Switzerland that corporate greed was causing climate change. Referring to “evil coal oil and gas industries”, DiCaprio said “Enough is enough.You know better. The world knows better.” What the…….? Who is encouraging this character to use his popularity to push this scam? Surely someone like him is too smart to know what hardship there would be in a world without coal oil and gas. Where’s the hidden agenda going on here? The fact that he’s an”Actor”doesn’t mean that he’s smart.He just likes to “Fly”around the world,telling us that”We”can’t use all the CO2,that he”Spews”out of his jet. Germany has found a cooling and warming trend, but cooler summers are a standout. Seems like the ONLY warming is coming from the OCEAN COOLING event that is the current El Nino. The wobbly northern jet stream is causing huge swings between warm and freezing in the USA and some other northern countries. Parts of the ocean are starting to cool rapidly as well, especially in the south and north. I really want to see what see the reaction of the alarmist trolls as the cooling from the sleepy sun starts to bite harder at some stage during the middle of the year. NOAA’s own data confirms RSS and UAH satellite data. At some point NOAA will have to admit that CO2 doesn’t cause any warming and 2015 was not the warmest year since the beginning of records. No mystery. When they can think of an excuse for altering satellite data, then they can make it match altered surface data. He compares the satellite and surface records with changes in atmospheric CO2 concentration. The satellites and CO2 are in step, the surface thermometers aren’t. If any of you want to read peer-reviewed journal articles about the Loschmidt effect, you could start with that by Dr Hans Jelbring from New Zealand here. If anyone deserves a Nobel Prize it is Dr Hans Jelbring (PhD in climatology) who had the above paper published nearly 13 years ago. AER is predicting a late winter in the NH. ‘The return to positive AO atmospheric state will result in an overall milder pattern across the Northern Hemisphere including the Eastern United States, Europe and Western Asia. The one exception is East Asia, which in part is due to extensive snow cover all winter that has insulated the region to the penetration of milder maritime air. Does anyone have a chart showing how the various temperature products GISS, HadCRUT, RSS, UAT reported the temperature AT THE TIME, i.e. before subsequent corrections and adjustments? It would also be interesting to see this animated, i.e. as the adjustments were made in history, as the temperature record evolved, and how they changed the record. Watts covered this story in 2008, the year of the sharp divergence. … the divergence appears to be human induced. “I hope you’re not right about the lack of warming lasting till about 2020. I’d rather hoped to see the earlier Met(eorological) Office press release with Doug’s paper that said something like—“half the years to 2014 would exceed the warmest year currently on record, 1998”! “Still a way to go before 2014. The key to this can be found in the various weather station location guidelines and standards. Good data only comes from those weather stations sited away from local heat sources; i.e. outside of the urban heat islands, away from air conditioners, jet engine exhaust, burn barrels and other loxalized heat sources. The problem is that urbanization envelopes previously reliable weather stations or heat sources are sited with no regard to the function of the weather station. No one thinks that paving and extending a runway would affect weather data but the gradual incursion of jet aircraft adds heat to the locale which affects the data. Climate change models are predicting only a few degrees in temperature change. It doesn’t take much to spoil a data set. The use of tree rings as a proxy measurement is also subject to localized conditions. Yes, the data can span thousands of years but we have no idea what the local conditions were in those years. This sort of data is only usable for numerous samples taken over a wide range. A sensible approach would be to validate the weather station installation or data set before using the data but this is not always the case. Depending on their agenda, “researchers” do use these spoiled data sets to validate their theory. For this reason, I tend to believe satellite and radiosonde data over ground data. I tend to agree, the terrestrial data has become corrupted. If one is looking for a ‘reliable’ ground level dataset I would suggest a low population area in order to avoid the urban heat island effect. One possibility is the Kerguelen Islands>. These are French territory and are inhabited and have weather monitoring. As such they should have a usable raw dataset. fig. 14: RSS is o.k. Just reading over quite a lot of the comments in this thread a common and long standing issue raises its head yet again – that of the warmists not having any experimental proof of their assertions. What I’m talking about is them proposing their basic hypotheses and testing these in the laboratory. Especially the basic hypothesis that increasing X %vol of CO2 in a volume of atmospheric air at room temperature results in that volume of air increasing its temperature by Y°C. You can rattle on as much as you like but if you can’t run the basic science you can’t convince us scientists and engineers.